I know next to nothing about this group who released two singles on Pye. 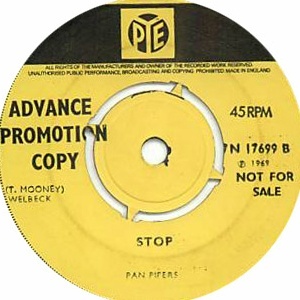 They were from Navan and were led by Terry Mooney, who is credited as writer of both sides of their debut single. 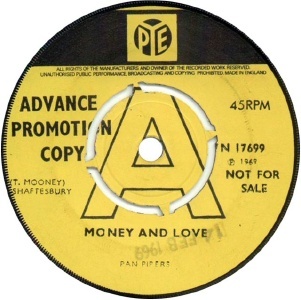 The A-side "Money And Love" was included on the Irelands Beat Groups 1964-69 CD on Sequel. As the liner notes of that CD say, the tracks is very Troggs-like, but with guitar tone and intensity set at a Shadows level. 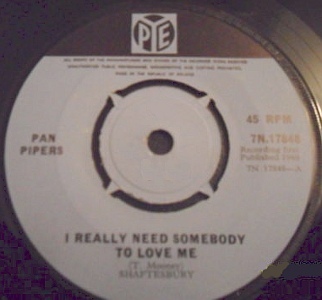 I haven't heard the second single which again featured two Terry Mooney originals "I Really Need Somebody To Love Me" and "A Little At A Time". 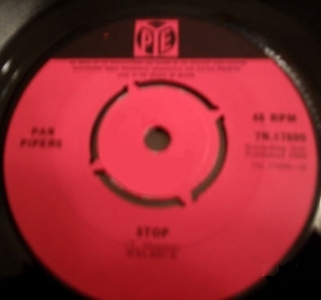 The Pan Pipers also contributed two covers to the Paddy Is Dead LP, a poor version of "Blue Suede Shoes" and a more successful but still meagre cover of "Back in the USSR". tracks: Blue Suede Shoes / Back In The U.S.S.R.